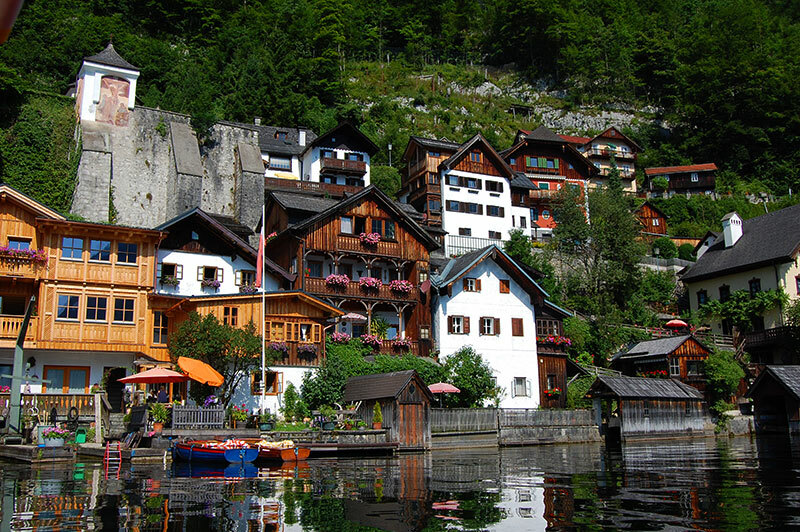 The lovely village on the shores of Lake Hallstatt (Hallstätter See) has thrived from salt production since prehistoric times. 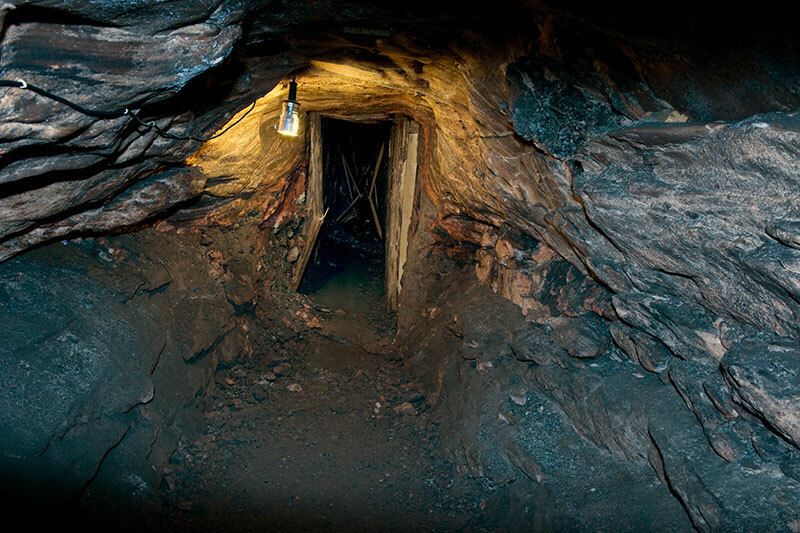 Today there are more tourists than salt miners. The village occupies a strip of land at the water’s edge, and the houses hang on the steep rock face. Hallstatt is small, and exploring even the back alleys will not require more than a couple of hours including a cake and cup of coffee. Hall is an old word for salt, thus giving name to the village. Salt is the reason for the 7000 years interest in the place. The oldest buildings in the village, such as the church Maria am Berg, originate from the 15th century, and many from the centuries thereafter. Since it has a UNESCO World Heritage status the village has been very well preserved. Thus, it’s an indeed a lovely place to leisurely roam for a couple of hours. 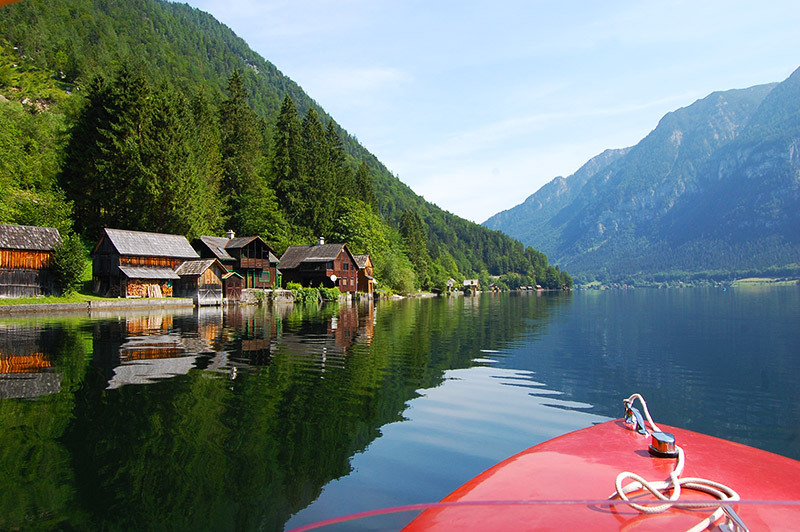 However, you are not giving Hallstatt all the attention it deserves, if you only explore it from land. I do strongly recommend that you hire an electric boat and cruise the like for an hour or so. The reward is not only that you get away from the tourist crowds, but also you get a completely new viewpoint. From the lake, you can really appreciate the traditional houses and how they almost tack on top of each other. If you aren’t comfortable boating yourself, you can always take the small ferry that makes its regular rounds on the lake. 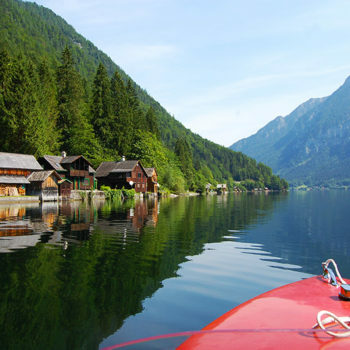 Until the road was built in 1890, the only way to reach Hallstatt was by boat or a narrow treasures path along the shore. 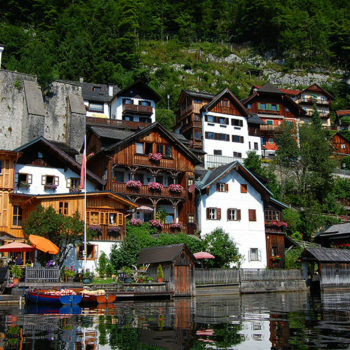 Nonetheless, roaming around the picturesque village is just half of the Hallstatt experience. A visit to the salt mine is obligatory. 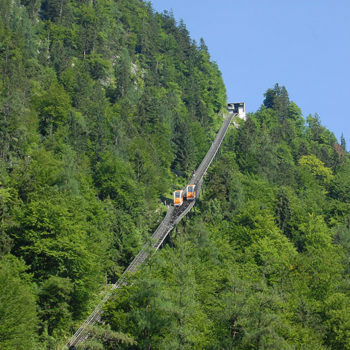 A mountain railway (funicular) takes you up to the salt mines and viewing platforms in a few minutes. 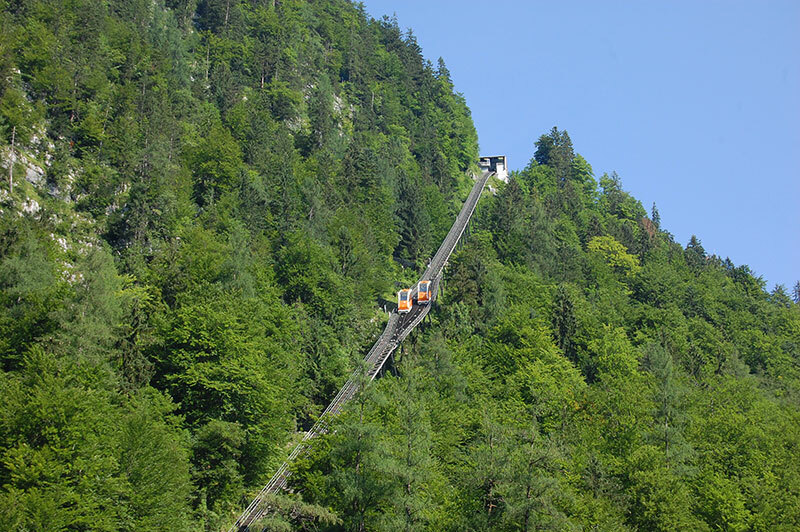 When you have soaked in the stunning views, it’s time to go underground. Salzwelten, gives you a great insight to all aspects of salt mining. 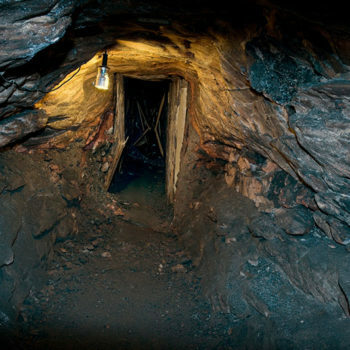 At 400 metres depth, there is a cinema show casing many of the discoveries made in the mine, among other an ancient wooden stair case and other impressive archaeology. The expositions are very interesting, but even more is the slide down into the mine and returning up with the salt mine train. 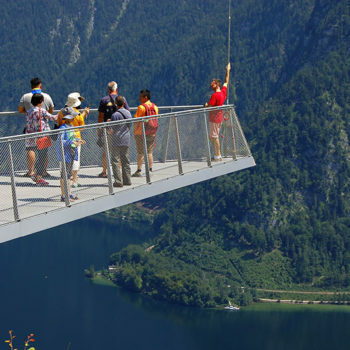 Either before or after your visit to the salt mine you just must get out on the skywalk. 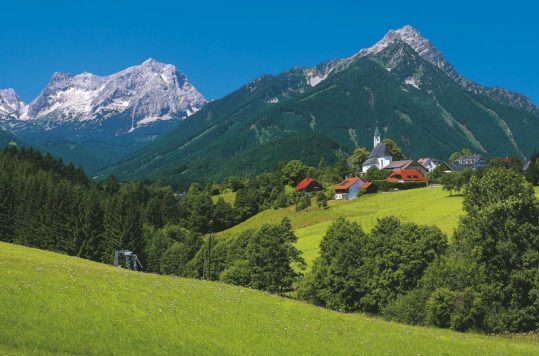 I never get tired of the spectacular views everywhere in Austria. 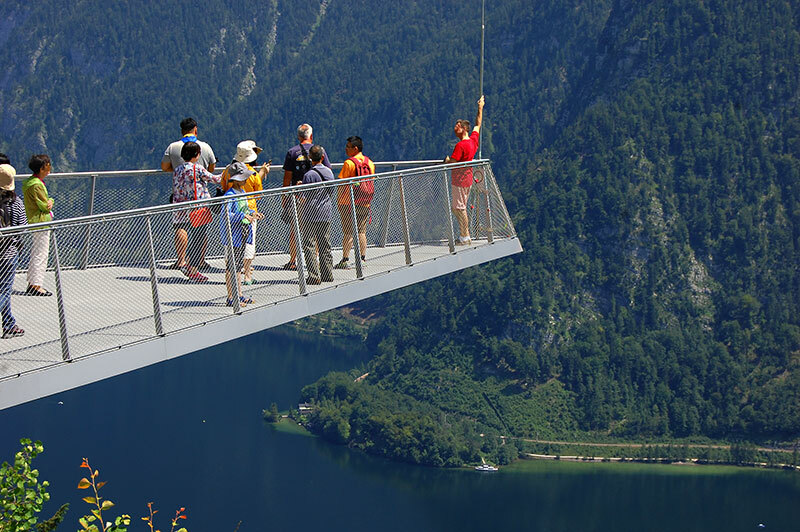 They have become very popular in the Alps, and of course they have also constructed a viewing platform above Hallstatt. The view of the village, lake and the surrounding mountains are simply stunning. If you are staying a day or two in the area, the new part of the village has some usefull services, in addition to accommodation and restaurants. 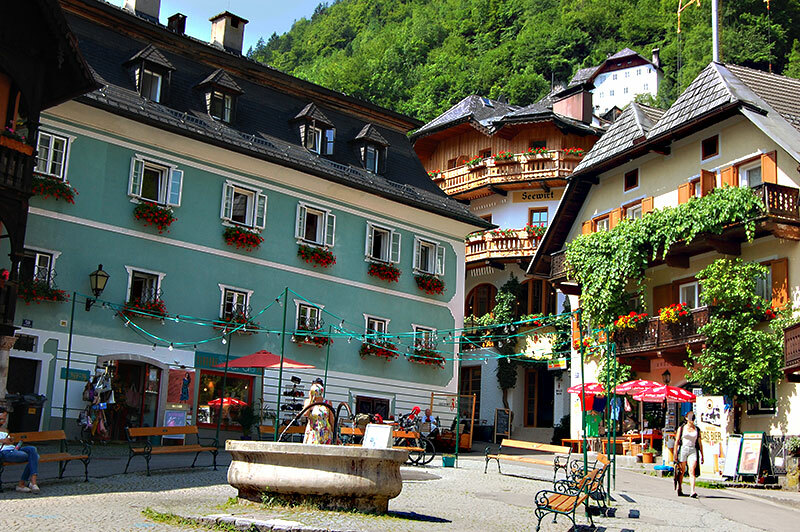 The old and new settlement of Hallstatt are about 300 metres apart. 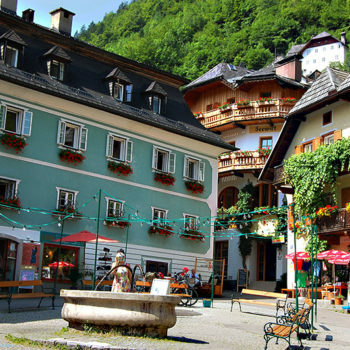 In the new part of Hallstatt, you find the Salzbergbahn station, a Tourist Information Centre, the bus station and a large car park. If you need a supermarket you find this here as well. On hot summer day, you can take a swim and chill out in the public park by the water. It has a lovely little island perfect for sun-bathing. If the rain is pouring down, head for the Hallstatt Museum. They have extensive display’s showing Hallstatt’s 7000 years of history. It’s right in the middle of the historical village.